← Wahoo! My new camera is finally here! Just in time for Halloween: Eeeeeeeeek! 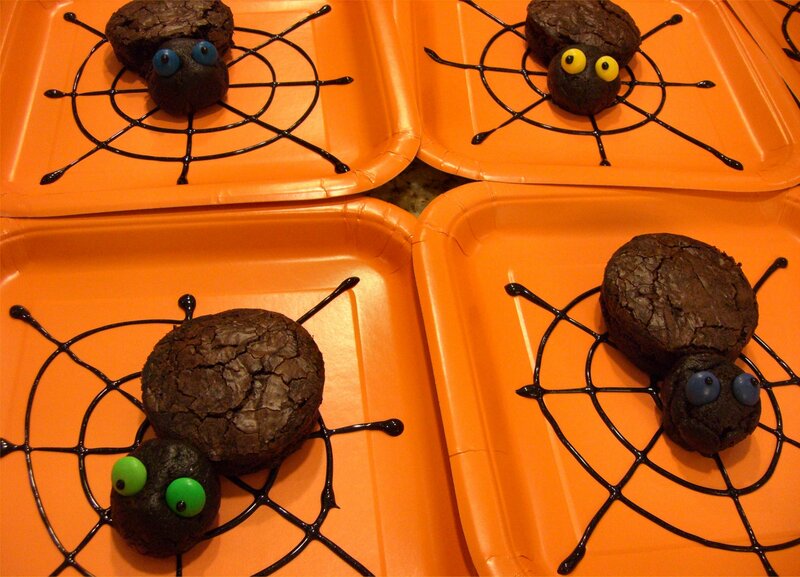 Brownie Spiders! 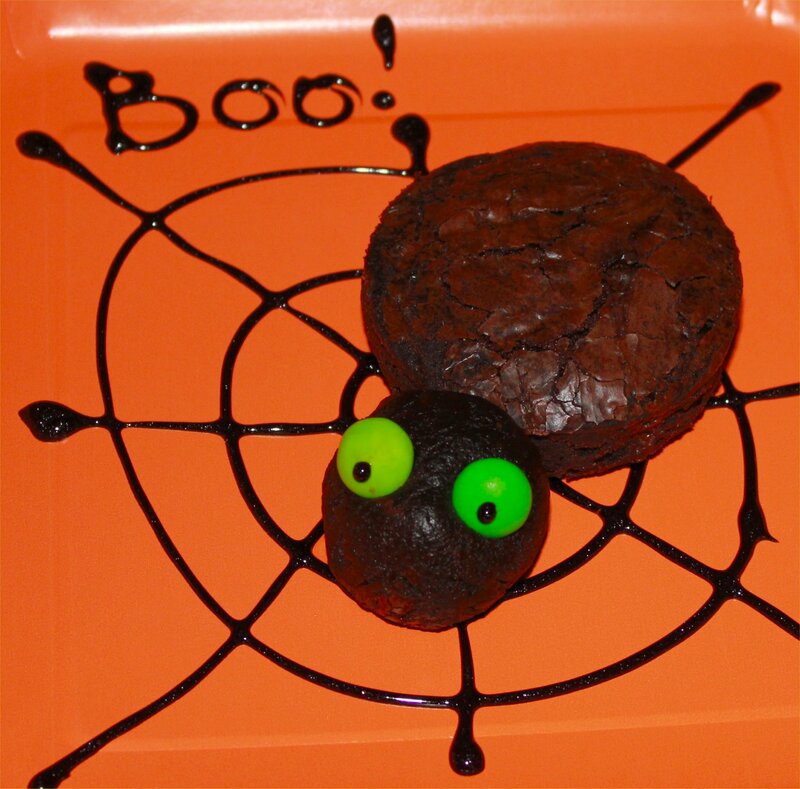 If you’re looking for something clever but deceptively easy for Halloween this year, try brownie spiders. Yes, I know…it’s a little early for Halloween, but I want to give you plenty of time to think about making these. Brownie spiders are fun to make, even more fun to serve and eat, and they’re sure to be a hit with both adults and children. For parties, everyone can make and decorate their own fudgy friend. They’ll be the best spiders you’ve ever eaten! Brownie Spiders - Creepy, Crawly Fun! Mix up the brownies according to package directions. Pour into a lightly greased 13”x9” baking pan lined with waxed paper. Bake as directed, until the brownies are completely set. Remove from the oven and allow them to cool completely. Using the waxed paper liner, remove the brownies from the pan and move them to a large cutting board. Use a biscuit cutter or an empty metal can to cut out circular brownies for the spider bodies. Using a small ice cream scoop or a spoon, scoop and shape spider heads by rolling smaller brownies into balls using your hands. Press two M&Ms into each spider head to make the eyes. Using the sparkle gel, draw one quick dot onto each eye to make pupils. You can have some fun here – make some looking down, some looking up, some cross-eyed. Using the Wilton black sparkle gel, draw concentric circles on each plate, then go back and draw straight lines across the plate from side to side and diagonal lines across each corner (see photo). It works best to work slowly and hold the gel tube just above the plate so it doesn’t touch. Once the webs are complete, place a spider in the middle of the plate. The best kind of spider - chocolate! I know, I know….I have too much time on my hands. But they’re cute, don’t you think? And the sparkle gel really looks great when it catches the light. And they taste great. My personal favorite is the Black Widow with blackberry sauce. So good! Would you rather have homemade Booberry sauce? Hee, hee…sorry. Enjoy, everyone. And happy early Halloween! Trust me when I say they were the best spiders I’ve ever eaten…and super cute too! Thanks for the great idea! I’m glad you were able to come out the other night and try them! I had a great time. I think I will have to try the Itsy Bitsy Tipsy Spider! or the Angelica Frangelica Spider, I think I’m out of kahlua, dang it!!! We are definitely going to have to try these for JonahBear!! He’s going to flip! Maybe I can pull them together and make them with my class too! Yeah, I couldn’t help but think of the kids when I made these. I do think Jonah Bear would love to make them, and Lilly Bug would love to eat them. For your class, you could probably use tubs of dark chocolate frosting to make the spider webs on the plates. Just spoon it into Ziploc bags, push all the air out before you seal the bag, and cut the tip of one corner off. It would be cheaper than buying the Wilton sparkle gel for a crowd. And it would taste better. You could also top the spider bodies with a spray of canned whipped cream instead of ice cream, and sprinkle on some brown cupcake sprinkles. You KNOW Jonah Bear would love that! Don’t forget to take pictures!